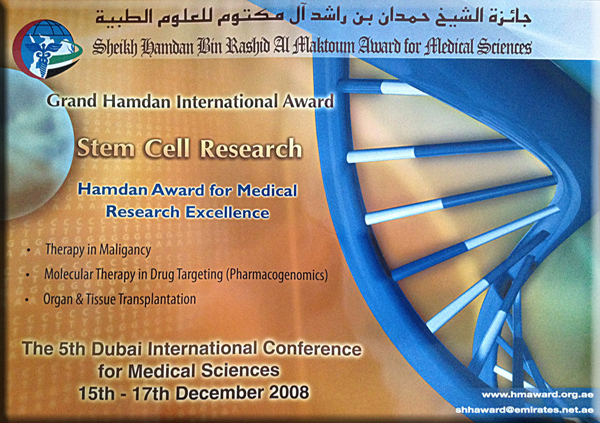 The topics of the 5th term, 2006-2007 were selected to be for Grand Hamdan International Award - Stem Cells Research, and for Hamdan Award for Medical Research Excellence - Therapy in Malignancy, Molecular Therapy in Drug Targeting (Pharmacogenomics), Organ & Tissue Transplantation. Stem cells are one of the most fascinating areas of biology today. Knowledge in this field has advanced in the area of healthy cell replacement of damaged cells and in the area of the development of an organism from a single cell, a promising area of science leading scientists to investigate the possibility of cell-based therapies to treat disease. Scientists have hypothesised that stem cells may be the basis of treating diseases like Parkinson's disease, diabetes, and heart disease. As scientists learn more about stem cells, it may become possible to use the cells not just in cell based therapies, but also for screening new drugs and toxins and understanding birth defects. However, human embryonic stem cells have only been studied since 1998. For treatments to be developed studies should be made of how stem cells remain unspecialized and self renewing for many years, and on identifying the signals that cause stem cells to become specialized cells. It has taken scientists 20 years to learn how to grow human embryonic stem cells in the laboratory after the specific factors and conditions that allow stem cells to remain unspecialized were identified. An important area of research is understanding the signals in a mature organism that cause a stem cell population to proliferate and remain unspecialized until the cells are needed for repair of a specific tissue. Such information is critical for scientists to be able to grow large numbers of unspecialized stem cells in the laboratory for further experimentation. Many questions about stem cell differentiation remain. For example, are the internal and external signals for cell differentiation similar for all kinds of stem cells? Can specific sets of signals be identified that promote differentiation into specific cell types? Addressing these questions is critical because the answers may lead scientists to find new ways of controlling stem cell differentiation in the laboratory, thereby growing cells or tissues that can be used for specific purposes including cell-based therapies. The realization that human cancers can be responsive to the manipulation of the immune system has only recently been documented. The immune approaches to the treatment of malignancy can be broadly classified into either active or passive immunotherapies. With active immunotherapy, treatment relies on the in vivo stimulation of the endogenous host immune system to react against tumors with the administration of biological response-modifying agents (ie, bacterial adjuvants, cytokines, tumor vaccines). With passive immunotherapy, treatment involves the delivery of biologic reagents with established tumor-immune reactivity (ie, antibodies or cells) that can directly or indirectly mediate antitumor effects and does not necessarily depend on an intact host immune system. Recently, substantial progress has been made in the identification and characterization of stem and progenitor cells in the mouse and human mammary gland. Furthermore, there is increasing evidence that a variety of neoplasms, including breast cancer, may result from transformation of normal stem and progenitor cells. Like their normal counterparts, the cancer stem cells have the ability to self-renew, driving tumorigenicity and possibly recurrence and metastasis, and have the ability to differentiate, generating the heterogeneity of the tumors. This stem cell model of carcinogenesis has important implications for understanding the basic biology of breast cancer, as well as other cancers. Furthermore, the concept of cancer as a disease of stem and progenitor cells has profound implications for the development of new strategies for cancer prevention and therapy. Recently, a number of ATLL patients have been reported to be in continuous remission after allogeneic stem cell transplant. There are specific molecular signatures associated with sensitivity or resistance to antiviral therapy which may useful in deciding on initial therapy for ATLL patients. In the presence of poor prognostic molecular features, early allogeneic stem cell transplant should probably be considered when feasible for ATLL patients and perhaps also in those who have responded to antiviral therapy and have persistent molecular evidence of the disease and a suitable stem cell donor. In the past several years, significant advances in the underlying biological mechanisms of renal cell cancer, particularly the role of tumour angiogenesis, have permitted the design of molecularly targeted therapeutics. Receptor and non-receptor tyrosine kinases (TKs) have emerged as clinically useful drug target molecules for treating gastrointestinal cancer. Two of the most promising new targets in the treatment of colorectal cancer are the epithelial growth factor receptor (EGFR) and the vascular endothelial growth factor (VEGF). Agents that inhibit the EGFR or bind to VEGF have demonstrated clinical activity as single agents and in combination with chemotherapy in phase II and phase III clinical trials. The other promising agent bevacizumab is a humanized variant of the anti-VEGF monoclonal antibody. The goal in the future will be to predict which specific chemotherapy and targeted agent combination will most likely benefit individual patients. Acute myeloid leukemia (AML) is a frequent hematological malignancy. Despite enormous therapeutic efforts that range from various cytotoxic agents to allogeneic stem cell transplantation, overall survival of patients with AML remains unsatisfying. The poor survival rate is mainly due to therapy-related mortality, failure of induction chemotherapy and early relapses. Therefore, novel therapeutic agents that are more efficient and better tolerated are eagerly sought after. For existing therapeutic strategies, there is a lack of markers that are capable of reliably predicting prognosis or the therapeutic response prior to treatment. There is hope that elucidation of the AML-specific proteome will prompt the discovery of novel therapeutic targets and biomarkers in AML. Differential response to the same drug in different patients is a common clinical experience. Many different factors may contribute to differential response including variable age and body size, diet, gastro-intestinal absorption, compliance with therapy and characteristics of the drug target. Understanding the variable response to drugs seems particularly pressing in the field of oncology, in which the stakes are high, drugs commonly have a narrow therapeutic index, and toxicities can be severe. Significant heterogeneity in the efficacy and toxicity of chemotherapeutic agents is observed within cancer populations. Pharmacogenetics (PGx) is the study of inheritance in interindividual variation in drug disposition. The allure of pharmacogenetics, in the treatment of cancer patients, comes from the potential for individualisation of cancer therapy, minimizing toxicity, while maximizing efficacy. Ideally, routine management of patients would include analysis of their single nucleotide polymorphism linkage disequilibrium (SNP-LD) profile prior to treatment, allowing stratification of patients into treatment groups, thus individualising their therapy. Epidermal growth factor receptor (EGFR)-targeted therapies have demonstrated remarkable success in a small subset of non-small cell lung cancer patients. The mechanism of response has been an area of active research, with somatic mutation in a number of genes in the EGFR signal transduction pathway and copy number alterations of genes of the EGFR family as candidates contributing towards response. Continuing studies should help determine an appropriate biomarker or combination of biomarkers that can be used to predict response to this class of therapy. Increased knowledge of the mechanistic properties of malignant growth has facilitated the development of molecular-based therapies that can act on specific targets. With molecular-targeted therapies, maximum antitumor effects may be achieved at doses that are considerably below the maximum tolerated dose. Adverse events are mild, manageable, and reversible on treatment cessation. Collectively, these findings support the use of targeted agents for improving the clinical outcomes and quality of life in patients with advanced NSCLC. These agents should be considered as a treatment option for patients who have failed or are ineligible for traditional chemotherapy. These observations suggest that as pharmacogenetics moves forward with ever more powerful genome-wide technologies, the field will benefit from a cautious approach to describing applications that are still in the future; "personalized medicine for all" is not on the immediate horizon, more a distant goal. A systematic approach to the dissection of important metabolic pathways using a combination of strategies and determining the applicability and clinical importance of the knowledge gained will move us toward this goal.42 Surrogate endpoints such as minimal residual disease or pharmacodynamic endpoints may provide earlier data than waiting for a large randomized trial to mature and allow greater focus on single drugs within a complex therapeutic strategy. Human embryonic stem (hES) cells offer an excellent source of cells for transplantation in the treatment of severe diseases. Embryonic stem (ES) cells hold promise for cell and tissue replacement approaches to treating human diseases. However, long-term in vitro culture and manipulations of ES cells may adversely affect their epigenetic integrity including imprinting. Disruption or inappropriate expression of imprinted genes is associated with several clinically significant syndromes and tumorigenesis in humans. Cellular overproliferation and tumour formation resulting from tissue or cell transplantation are potential problems that must be addressed before clinical trials of ES cell-based therapy are initiated. Hematopoietic stem cell transplantation has become an increasingly important treatment modality for hematologic malignancies. Autologous stem cell transplantation has become the standard of care in relapsed high-risk diffuse large B-cell lymphoma (DLBCL) patients who respond to reinduction therapy. The exact role of allogeneic transplantation in DLBCL is still unknown and it appears to be useful in only a select group of patients. The exact role of hematopoietic stem cell transplant in follicular lymphoma is evolving. The treatment of mantle cell lymphoma is challenging and stem cell transplantation may play an important role, as our understanding of the biology and natural history of this disease improves. Cord blood has served as a source of hematopoietic stem and progenitor cells for successful repopulation of the blood cell system in patients with malignant and nonmalignant disorders. It was information on these rare immature cells in cord blood that led to the first use of cord blood for transplantation. Further information on these cells and how they can be manipulated both in vitro and in vivo will likely enhance the utility and broadness of applicability of cord blood for treatment of human disease. Both type 1 and type 2 diabetes patients would greatly benefit from transplantation of insulin-producing pancreatic beta cells; however, a severe shortage of transplantable beta cells is a major current limitation in the use of such therapy. Understanding the mechanisms by which beta cells are naturally formed is therefore a central challenge for modern pancreas biology, in the hope that insights will be applicable for regenerative cell therapy strategies for diabetes. In particular, the cellular origins of pancreatic beta cells pose an important problem, with significant basic and therapeutic implications. Embryonic stem (ES) cells are a unique resource, providing in principle access to unlimited quantities of every cell type in vitro. They constitute an accessible system for modeling fundamental developmental processes, such as cell fate choice, commitment, and differentiation. Furthermore, the pluripotency of ES cells opens up opportunities for use of human ES cells as a source of material for pharmaceutical screening and cell-based transplantation therapies. Widespread application of ES cell-based technologies in both basic biology and medicine necessitates development of robust and reliable protocols for controlling self-renewal and differentiation in the laboratory. Bone marrow–derived cells (BMDCs) can develop into epithelial cells in the lung, liver, gastrointestinal (GI) tract, and skin. These findings, initially reported in laboratory animals, have also been reported in humans. It is not yet clear which subpopulation(s) of the bone marrow (BM) has the ability to become epithelial cells. Another unresolved question regarding this BM to epithelial transition is the mechanism by which this occurs. Professor Donald Metcalf was born in Mittagong, New South Wales, Australia, and was educated in various country schools. He graduated in medicine from Sydney University in 1953 after completing a BSc (Med) in virology. After an internship at The Royal Prince Alfred Hospital, Sydney, he joined the staff of The Walter and Eliza Hall Institute of Medical Research in Melbourne in 1954 as the Carden Fellow in Cancer Research, a position he continues to hold. Sir Roy Yorke Caine, FRS (born 30 December 1930) is a fellow of the Royal Society and was Professor of Surgery at Cambridge University, 1965-98. He is a pioneer of liver transplantation and performed the first such operation in Europe in 1968. Much of his subsequent work focused on the improvement of immunosuppression techniques aimed at prolonging the life of liver transplant recipients. He was elected to the Royal Society in 1974 and knighted in 1986. Dr H Lee Sweeney PhD is a William Maul Measey Professor and Chair, Department of Physiology of the University Of Pennsylvania School Of Medicine in Philadelphia of the United States of America. His other School of Medicine affiliations are Pennsylvania Muscle Institute, Department of Medicine (Division of Cardiology), Cell and Molecular Biology Graduate Program. He has obtained the following degrees: S.B., Massachusetts Institute of Technology, 1975, A.M., Harvard University, 1980, Ph.D., Harvard University, 1984. Axel Ullrich was born on October 19,1943, in Lauban, Schlesien, Germany. Prof Ullrich has been the Director of Molecular Biology at the Max Planck I nstitute of Biochemistry in Martinsried, Germany since 1988. After taking a degree in biochemistry at the University of Tuebingen, Germany, he received a Ph.D. from the University of Heidelberg in Molecular Genetics in 1975. The leader of voluntary, humanitarian and charity work. The humanitarian efforts in the night of giving His Highness Sheikh Hamdan bin Zayed AI Nahyan, has obtained the highest Merits from a number of countries, international organizations and bodies, in recognition of the achievements of what has been realized and the offered assistance, was meant to advancing the vulnerable and to support their cases in various areas of special humanitarian circumstances to support the call for the advancement of these groups and to reduce suffering and save Hula contribute to the improvement of fact, who relive, and the maintenance of human dignity. Field Marshal Abdurrahman Mohamed Hassan Swaruddahab was born in the city of Umdurman, Sudan in 1935 to a great family remotely related to AI-Abbas Bin Abdulmottaleb. His grandfather, the renewed Islamic scholar Issa Swaruddahab, had come from Mecca in the fifth century AD. This family had played a prominent role in the history of Sudan as Islamic scholar Mohamed lssc Swaruddahab had introduced the Abu Omar AI-Darawi's style of Quran recital prevailing in northern and central Sudan. "Proyecto Vision" is a Spanish volunteer organization created by a group of Ophthalmologists in 1994 and founded as an establishment in 1996 under the presidency of Dr. Julio de la Camara that provides ophthalmologic medical care to the population of Tigray region in Ethiopia. "Proyecto Vision" provides help in different ways. Society for Health Education (SHE) was established in 1988 that is pro active in identifying and addressing crucial health and social concerns of the Maldives. The Organization aims to foster family well-being in general and in particular empower families and women to make informed choices when seeking services from medical professionals. It advocates individuals to exercise their right to be informed of the nature of diagnosis and consequent treatment. Dr. Abdul Rahman AI Awadi is a well known figure in the history of Kuwait. After completing his studies in medicine he started his professional career as a Physician in the Ministry of Public Health Hospitals in Kuwait. He has become the Raporteur in the Planning Committee of the Ministry of Public Health; subsequently he became the Registrar of Medicine and Assistant Director of Preventive Services Department then the Director. In 1975 he has become the Minister of Public Health till 1987. In 1983 he has become the Minister of Planning with the additional position as a Minister of Public Health. He continued as a Minister of Planning till 1990 then he has become the Minster of State for Cabinet Affairs till 1991. Dr. Sadiqa AI-Awadi is the Director of the Genetics Centre, Sabah Hospital in Kuwait. She completed her MBBCH and DCH from Ain Shams University in Egypt, and her MD from Dublin, Ireland. She has served in various positions in several hospitals in Egypt and Kuwait in her professional life. In 1979, she established the Kuwait Medical Genetics Centre and to the present day, serves as its Head. Professor Mohamad A Mikati is the professor and chairman of the department of pediatrics and adolescent medicine, Department of Internal Medicine, Pharmacology and Biochemistry, Director of Adult and Pediatric Epilepsy Programme in the American University of Beirut. He gained his masters in 1980 from the University and started his carrier as a professional doctor. He has achieved in building the department of pediatrics at the American University of Beirut. He has played a major role in providing support to the medical community and introduced Epilepsy Programme in 1995. His researches focused on understanding of the mechanisms of neuronal injury secondary to seizures and methods to prevent them. In May 1984 His Excellency, Sheikh Nahayan Bin Mubarak AI Nahayan, the Supreme Chancellor of the University, announced the opening of a Faculty of Medicine. Remarkably, only two years later, the first cohort of medical students entered the new medical school; another major promise of the Chancellor's vision was achieved when they began medical practice in 1994. The Syrian Center for Tobacco Studies provides a pioneer model of international cooperation for the establishment of sustainable research base in a developing country setting. It addresses the needto create local expertise not only in research methodology, but aIso i n researc h su pport and fu nd ra ising areas. The overall goal of SCTS is to forge a sustainable institution which draws on a wide range of complimentary expertise and resources from developed and developing nations and serves as a model of scientific excellence and commitment to the health of people in the developing world. The department is one of the departments from the Rashid Hospital, under Department of Health & Medical Services governed by the Dubai Health Authority. The Committee was impressed with the significant service contribution made by the Department which was established more than 30 years ago. Mr. Obaidullah belongs to the early generation of the United Arab Emirates. The tough conditions and the harshness of time shaped him into one of the leading and self-made personalities of the country. He was born in 1935 in the Emirate of Ras AI Khaimah. He lived his early years in the suburbs of the Emirate of Dubci. where he received his studies and later became a young merchant. Dr. Salem Abd-Allah was born in Sharjah city in 1939. He started his education in Sharjah and then he attended a school in Bahrain, where he completed his primary education in 1955. In 1961, he graduated from a high school in Kuwait. Mr. Abdul Ghani graduated from Cairo University in June 1971, on completing his required interning year he returned to Dubai. He was appointed as a Senior House Officer at AI-Maktoum Hospital and was later transferred to the newly opened Rashid Hospital. Dr. Abdurrahman I AI Diab born in the year 1962 graduated in medicine & surgery from the college of medicine, King Saud University, Kingdom of Saudi Arabia in the year 1985. 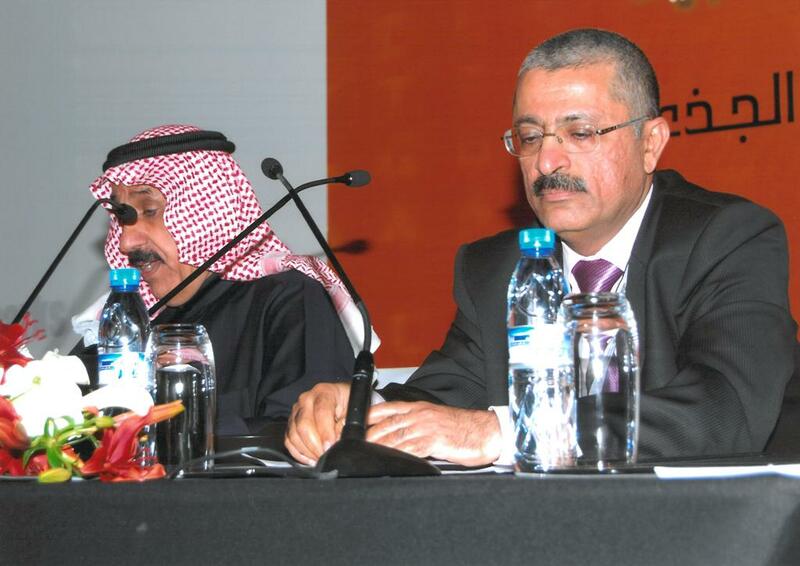 He has achieved a medical specialization in internal medicine from the Arab Board in the year 1991.